April Lady is an enjoyable albeit predictable read. Our hero, Cardross, and our heroine, Nell, have been married over a year when the novel opens. The book begins with an argument over money. The wife is being scolded by her husband for going over her quarterly allowance. It’s not that he’s not fabulously wealthy. He is. He just wants his wife to be able to account for the money he’s given her, for the unpaid bills that arrive at the house. Nell is keeping secrets from her husband. She is lying about giving money to her brother, Dysart, to cover his gambling debts. She knows she is disobeying her husband by “supporting” her brother like this. But she can’t understand why her husband blames Dysart for being an addict. He should know that Dysart just can’t control himself when it comes to gambling and racing. Being unsure of her husband’s love (and respect), Nell spends much of her time afraid of her husband. She’s afraid to be honest with him, which is all that he is asking of her. Both husband and wife are deceived. She is certain that he doesn’t love her, that their marriage is one of convenience not love. And he is certain that she doesn’t love him, that she married him for his money. (Her family is always in need of money since her father and brother are gambling addicts.) The reader is the only one who knows the truth: these two do love each other, and have loved each other from the beginning. Is Nell as silly as she seems? Is Cardross as tyrannical and unforgiving? Will these two ever be completely honest with one another? While I didn’t love the plot of this one–at least as much as other Heyer novels I’ve read in the past–I did enjoy the characters. Particularly the “minor” characters. Nell has a sister-in-law, Letty, whose troubled love life steals the show. She’s in love with a man, Jeremy Allandale, deemed “unsuitable” by her older brother. (Letty gets one of her many scoldings in the second chapter.) This love affair is “aided” by Letty’s cousin, Selina Thorne, a young lady who has read too many novels. This romance provides my favorite scene of the novel! Dysart, Nell’s brother, and Mr. Hethersett, Cardross’ cousin who has a way of being in the right place at the right time to aid Nell out of her messes, also add to the novel’s charm. Becky has been reviewing books at Becky’s Book Reviews since August 2006. She reviews a variety of books—middle grade, young adult, and adult. She loves discovering new authors, and is very thankful to her mom for recommending Georgette Heyer. Becky is also the host of the Georgette Heyer Perpetual Reading Challenge. You can follow Becky on Twitter as blbooks. 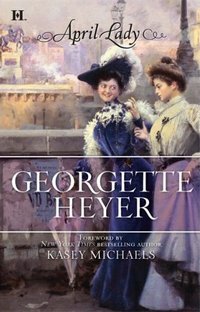 Enter a chance to win one copy of April Lady, by Georgette Heyer (Harlequin, 2009) by leaving a comment stating what intrigues you about the plot or characters, or if you have read it, which is your favorite character or scene by midnight Pacific time, Monday, September 6th, 2010. Winners will be announced on Tuesday, September 7th, 2010. Shipment to continental US and Canadian addresses only. Good luck! As I had already mentioned with Sprig Muslin, Heyer was starting to reuse a few of her plots in this stage of her life. But unlike Sprig Muslin, April Lady IMHO is NOT an improvement over its predecessor The Convenient Marriage. Nell is an ingenue -thus the April lady of the title- but she lacks the sparkle that Horry possesses. So Becky, I am more severe that you are, because not only I do not love it, in fact it is among the few I really dislike. Not even the secondary characters save it because to a certain degree, Nell’s brother had ben Pel, Horry’s brother, in The Convenient Marriage and Letty’s problem had already been the problem of Arabella Ravenscar in Faro’s Daugther. So there was nothing new under the sun with this one, not even an interesting twist which could make it different. I didn’t like this one enough to reread it, so I don’t much remember it any more. This is one of the two Heyers that I no longer reread, the other being Lady of Quality, Heyer’s last book which was an inferior quality rewrite of Bath Tangle. Cinthia is exactly right–this story was done much better in The Convenient Marriage. Nell is just TOO clueless, and what is usually uproarious farce seems silly and contrived in this book. Heyer completists will want to read it, but probably only once. Rhonda, aren’t you referring to Black Sheep rather than Bath Tangle as the predecessor to Lady of Quality? This is one of my least favorite Heyers. I just don’t like the hero and heroine very much. It just wasn’t as enjoyable as The Convenient Marriage. I’m glad I read it…once…but I don’t think I’ll be rereading it. Interesting . . . there seems to be a lot of negative feedback on this one. I think I’ll put it lower down on my “to read” list of Heyer novels with The Convenient Marriage more towards the top. I did like the description of the minor characters and their intrigues. I love sometimes when minor characters are so delightful that they steal the show. For me, this definitely ranks among the ‘lesser’ Heyer novels. Letty is the only real highlight and thankfully distracted me from the all-consuming need to slap both our hero and our heroine for their immature behaviour. I liked the book and will reread it. That the couple in this novel is already married when the story begins is what intrigues me. I’d be interested in reading this Heyer. Cinthia, you are quite right! I definitely meant Black Sheep, not Bath Tangle, and Miles of course, being much better with the same plot as A Lady of Quality. Brain fart! Sorry, and thanks for catching that. Oh dear… I enjoyed The Convenient Marriage, so this might pale in comparison. Thanks for all the honest feedback. Can’t agree that Horry was a sparkling heroine: The Convenient Marriage is a Heyer I rarely re-read. Not so with April Lady. I could so see how the misunderstandings between the two grew. I loved the h/h and the secondary characters were magnificent. Who could forget the footman staggering under the weight of the diamond-chipped dressing case. Sprig Muslin I’ll agree was not a favourite. To me it did seem rather a re-tread. After reading all the reviews this month and all the comments I have come to the conclusion that I loved all of Heyer’s novels – even the bad ones. I just love some of them more than others. (Correction – I didn’t like My Lord John, but that’s the only one.) If the main characters aren’t great, then the secondary characters usually save the story, and that’s the case with this one. I just read this book for the first time last month and loved the fact that the hero and heroine were already married. It is not my favorite Heyer, but that little twist on her usual plot makes this novel stick out from the crowd. This sounds interesting — especially with the marriage already having taken place. Even if this isn’t one of Heyer’s very best, I am still looking forward to reading it! I’m intrigued by three things; a) that the hero and heroine are already married; b) that so many commenters were less than enthralled with this one; and c) a cast of secondary characters that sound appealing. Okay, I’m going to fly in the face of the majority of comments and admit that I’ve read April Lady multiple times–because I truly like it. The novel gives us a glimpse of what happens AFTER the idyllic courtships she so often portrays. Nell’s horror over the unpaid bill for her Court dress is perhaps more comprehensible when one does the math: 300 pounds in Nell’s day is equivalent, roughly, to $30,000 in ours. It’s a huge sum she can’t bear to admit to a husband that suspects she’s a gambler like all the rest of her family–and that she married him for money. The echoes, for me, are of the true-life dilemma Georgiana, Duchess of Devonshire, experienced–unending debt that led to marital upheaval and eventually, her premature death partly as a result of anxiety. I think Heyer presents the corrosive nature of doubt in a relationship with remarkable finesse; it’s almost painful to read Cardross’s growing disillusionment and Nell’s desperation as she realizes she’s trapped in a mess of her own making–had she been honest at the outset, she’d have avoided weeks of unhappiness. For me, it makes the mutual understanding and forgiveness at the novel’s close all the more effective. I loved The Convenient Marriage, so I feel a little trepidation in adding this to my list. However, Stephanie’s comment has offered an interesting viewpoint. Perhaps this is not simply a retelling, but taking the same basic story elements and treating them more seriously than she had before. That I would be interested to read. Sounds like a very intense story with everyone having already made up their mind, husband and wife. It has been years since I’ve read GH. However, after visiting Austenprose and reading the reviews, I long to revisit the wonderful world of GH. I have a number of these books in hardback and mostly w/ the dustjackets. Therefore, it disturbs me greatly to see that the cover pic for April Lady shows women in attire of the late Victorian /early Edwardian era–approximately 100 years after the time period in which the novels take place. I am sorry if any reviewer has an interest in Harliquin Publications. However, an error of this nature on the part of a mass produced trade paperback publisher hardly surprises me. Several years ago when GH’s novels began to be published and distributed by Harliquin, some comments were made onnperhaps, one of the GH sites that Harliquin was omitting parts of some of the novels and/or was changing some of the original language, I.e., the cant expressions in the name of modernizing the novels–essentially a “dumbing down”. Does anyone else recall this? Again, I am sorry if I have offended anyone from Harliquin. Such was not my intention. While this is not my favourite by a long chalk, it is an absorbing read, best appreciated by ‘mature’ readers as with The Convenient Marriage. The treatment of the main relationship is serious, much more so than, for example, the marital issues in Friday’s Child, and its subtlety is unlikely to be appreciated by those who still firmly believe in ‘happily ever after’. Purely coincidentally, I am reading Stephanie Barron’s second Jane Austen book at present, and it is lovely to find myself in agreement with her about this other book. So is this one of FOUR “marriage of convenience” books that Heyer wrote? The other three being Friday’s Child, A Civil Contract, and The Convenient Marriage? Hmmm. I’m always interested in seeing author’s deal with “what happens after” the wedding, but I have to say, this couple sounds eminently slappable. I haven’t read this one yet. What intrigues me about this book are the minor characters. Sometimes side characters are what make a book memorable for me. While this moved more slowly for me, I found it a good read seeing how the characters worked through their misunderstandings, showing how important communication is in marriage. I am halfway through April Lady and I am really enjoying Nell and Cardross’s relationship tension. The great thing about Heyer is she writes the romantic parts in such a way that you can feel the passion/sexual tension without her having to say much. It is obvious they both are in love with each other. Her brother though is very annoying and deserves a big set-down, as they say. I only discovered Heyer about 2 months ago and have been rabidly going through them so perhaps I need to take a break because all these characters running up debt and expecting family members to bail them out is getting on my nerves. Her brother has nothing good to recommend him and I don’t see what Nell sees in him. I hope he gets his comeuppance at the end of the book or at least reforms his ways. Cecily, your reactions is not uncommon. Many of Heyer’s novels have similar themes and when read too close together they run together and get muddled. I recommend slowing down your reading pace and savoring for a few months before you jump into the next one. I am glad you are enjoy her.